This homemade chicken shawarma recipe is always in the list of my signature recipes that I would like to introduce to my friends, alongside its Western counterpart, Chicken Parmesan. Since the first time it came to my life, this aromatic dish has never ceased to exit my mind ever. I still remember clearly the satisfaction of enjoying the dish on my business trip to Kuwait. But then, it was not until recent days that I digged out my very own chicken shawarma at home to cater my taste. Also, check out the recipe video for full details! These awesome chicken shawarma wraps Are incredibly quick and easy to make! Firstly, What Is Chicken Shawarma? Shawarma is a dish which consists of thin slices of shaved meat such as beef, lamb, chicken, turkey or veal – served with flatbread and an assortment of vegetables. However, the secret for its authentication should be the cooking method: Various layers of meat are skewered on a spit and slowly roasted liberally on both sides. 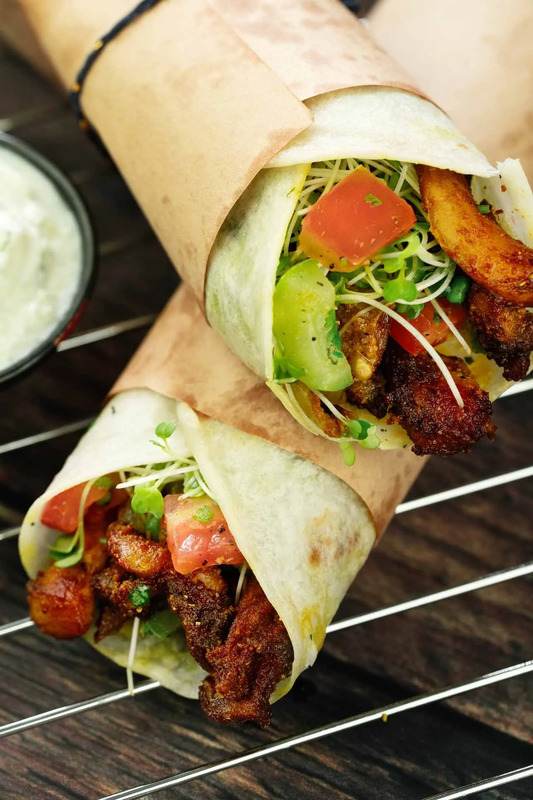 Despite having been long known as one of the most favorite street foods in Middle East, chicken shawarma wrap is actually an Arabian fast food which was originated in Turkey. The dish then gradually became one of the world’s most popular street foods, especially in the countries of the Levant and the Arabian Peninsula. For that reason, nowadays chicken shawarma has been a staple part of citizens in the Middle Eastern countries. The main protein I use in today’s recipe is chicken (either chicken breasts or thighs are fine). Well, it’s a shame that I don’t actually have a revolving spit. I do wish I could do the traditional way just for once! Therefore, we’ll bake the chicken in the oven. It’s one of the easiest cooking methods to cook chicken, but believe me, the taste will be incredible. What Spices Are In Chicken Shawarma? It is indeed unquestionable that the soul of authentic homemade chicken shawarma lies in the spices. These includes cumin, turmeric powder, ground coriander, garlic powder, paprika and ground cloves. As a result, you won’t believe how these simple ingredients can lend a flavor so rich and exquisite that sure to captivate your palate at the first tasting. At first, if you take a quick glance at gyro and shawarma, they seem to be very alike. Both of them calls for shaving of chicken from a large turning meat cone. I have to admit that it’s a brilliant way to help keep the very unique meat juice’s flavor. However; lamb, beef, tomato, tzatziki and onion toppings are the main ingredients of gyro. Meanwhile, shawarma calls for a whole range of toppings: from tahini, tabouli, fattoush, to cucumber and even hummus. Is Chicken Shawarma Good For You? We all know how chicken itself is beneficial for weight-loss, so – yes. As science proofed, chicken shawarma offers 15g of fat, and 400 calories – which takes up only 24% of an ideal adult’s daily intake of calories. Totally not so alarming at all. What Goes Perfect With Chicken Shawarma? As a true Middle Eastern dish, chicken shawarma usually comes with pita breads, pickles, and heaps of fresh veggies and sauce. Similar to meat shawarma, zesty drizzles of tzatziki sauce are often a good dressing choice for chicken shawarma wrap. Other ideal chicken shawarma sauces are garlic sauce and tahini sauce. In the end, this homemade chicken shawarma is one of my family’s favorite weeknight dinners, along with other awesome healthy chicken dishes. Be sure to check them out and I’m sure you’ll love them like my whole family does. So, happy cooking and I’ll see you next time! Although the pictures should have said tons about chicken shawarma wrap, I must still make an affirmation myself that this dish just has me, from head to toe, nothing more. No matter if I’m demanding an effortless brunch or a wholesome and nutritious noon snack in hot summer days, it can be anything. Now, come join me to regret just none. Tortilla pasta or steamed rice. First, mix all the ingredients for the spice mix in a small bowl and set aside. Next, put the chicken meat in a large bowl, season with the shawarma spice mix, onions, lemon juice, olive oil, salt and pepper. Then toss them all together to make sure the chicken pieces are evenly coated in the marinade. After that, cover with a plastic wrap and store overnight in the fridge for at least 3 hours. To begin with, remove the marinated chicken from the fridge, and let it reach room temperature. After that, spread the marinated chicken and the onions on the baking tray lined with baking sheet. It is important to make sure all the chicken pieces are lying flat and not on top of each other. Then bake for 25 minutes at 425 degrees F.
Meanwhile, prepare the chicken shawarma sauce to your preferences. Usually, I use a simple Greek Tzatziki sauce to enhance the chicken's flavor. However, garlic sauce or tahini sauce work fine as well. Finally, I often enjoyed my homemade chicken shawarma in tortillas with a few stems of cress, and finally some drizzles of your favorite chicken shawarma sauce and olive oil. Therefore, be creative all you want. You can certainly substitute chicken breasts for the thighs with no different cooking time. It is sure much more tasty if the chicken is coated in the marinade and let sit for 1 day beforehand in the fridge. When ready to serve, simply defrost it on the next day before cooking. Moreover, the chicken can also be frozen in its marination – as long as the meat has not been previously frozen – for up to 3 months. Be sure to check out the recipe video as well! It’s no surprise to me that shawarma is Turkish but haha I’ve barely eaten shawarma that’s oven-baked. And it’s honestly gorgeous! Big thumps for ya. I tried this once not so long ago, somewhere in Karachi, and they were kind of roasted and sliced right off the rotating spit. There were loads of mayo in the rolls too. I’ve been seeking for the recipes and yours seems to be the least oily, love that! Very detailed recipe. I personally I love the spice mix the most, it’s unbelievable. I also don’t prefer wrapping them in tortillas but the tzatziki is truly a match! Sorry, but I will say no to the cress. Like, the breast meat is ‘OK’ in taste, but why cress? They’re too contrasting in taste and that strikes me as odd. Just wanna ask do you have to warm or somehow, bake the tortillas? Just so it’s slightly crispy and more biteable? I suppose it would be a bit leathery, no? Anyway, thanks for the instruction, very informative. This chicken shawarma is so easy to snack on, like, I can finish a batch of it alone in 10 minutes time! That’s crazy. I love it more this way more than in wraps. Thumbs up. After seasoned, I stored the chicken for only an hour but it’s still very aromatic and also not too bland. I’d expected it to be pretty greasy, judging on the pictures, but they’re not 😀 Thanks for sharing. I imagine it would be marvelous if it was veal. But well, sure I’ll give this recipe a try. Can’t resist the display. Thanks!